VANCOUVER, Oct. 3, 2018 /CNW/ - Hannan Metals Limited ("Hannan" or the "Company") (TSXV: HAN) (OTCPK: HANNF) is pleased announce that final drill permissions have been received from the relevant authorities to allow diamond drilling to commence at the Ballyhickey project within the 100% owned Clare zinc project in Ireland. 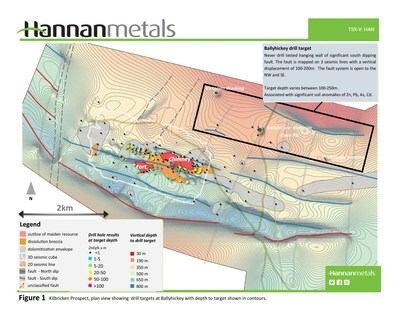 Michael Hudson, Chairman and CEO states, "With drill permits in place we are very excited to commence drilling at Ballyhickey, one of the most important Victorian-age mines in Ireland and an extension of the Kilbricken mineralized system, situated 2 kilometres from the main resource area. The project has essentially waited 180 years to be drill tested. Historic reports state the mined "ore" ran 77% Pb and 15oz Ag, with a calcite vein 5-6 metres wide. 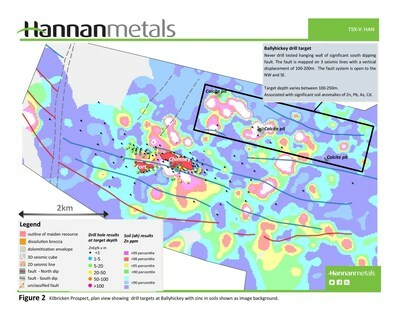 With modern day seismic surveys now showing that mineralization in the historic pit lies in the stratigraphic hanging wall of the Waulsortian reef, approximately 70 metres above the level of stratabound Zn-Pb-Ag mineralization now targeted across Ireland." Over the last few months, Ireland has experienced a short hiatus regarding environmental screening for mineral exploration drilling applications. The Exploration and Mining Division of the Department of Communications, Climate Action and Environment of the Republic of Ireland has informed the mineral exploration industry that the legislative issue has recently led to an effective short-term moratorium on new drilling permits being issued to mineral explorers throughout the Republic. However, rewriting of the legislation is imminent, which will return the Irish drill permitting procedure to its once efficient and thorough status quo. In the meanwhile, Hannan has sought, and has received drill permissions from the Clare County Council (the "Planning Authority"). The Planning Authority concluded diamond drilling at Kilbricken and Ballyhickey, Quin, Co. Clare constitutes development which is exempted development as defined by the Planning and Development Acts, 2000 (as amended) and associated regulations.